John Nash, the younger son of William Nash and his first wife, Caroline Jackson, was born in Kensington on 11th April, 1893. His father was a successful lawyer who became the Recorder of Abingdon. He was educated at Langley Place in Slough and at Wellington College. According to Ronald Blythe: "In 1901 the family returned to its native Buckinghamshire, where the garden of Wood Lane House at Iver Heath, and the countryside of the Chiltern hills, with its sculptural beeches and chalky contours, were early influences on the development of the three children. Their lives were overshadowed by their mother's mental illness and Nash himself was greatly helped by his nurse who, with some elderly neighbours, introduced him to the universe of plants." Nash's mother died in 1910, when he was seventeen, he was apprenticed to the Middlesex and Berkshire Gazette as a trainee journalist. Meanwhile, his elder brother, Paul Nash, had enrolled at the Slade School of Art. 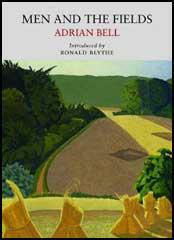 He introduced him to some of his friends, including Dora Carrington and Claughton Pellew. On the advice of his brother, he never attended art school. In 1913 he following year he shared an exhibition at the Dorien Leigh Gallery with his brother. He also joined the Camden Town Group. Other members included Percy Wyndham Lewis, Henry Lamb, Spencer Gore, Walter Bayes, Augustus John, Adrian Allinson, Maxwell Gordon Lightfoot, Walter Sickert and Harold Gilman. Nash was unable to enlist due to health reasons on the outbreak of the First World War. However, in 1916 he joined the Artists' Rifles. 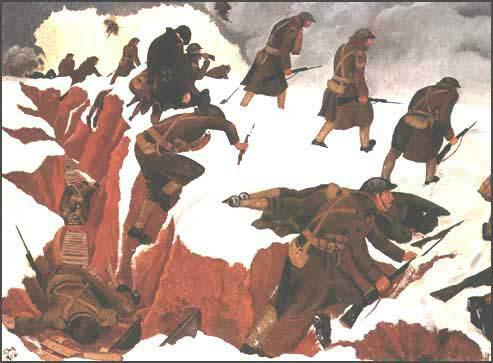 He fought on the Western Front for nearly two years before he was recruited by John Buchan of the War Propaganda Bureau (WPB), as an official war artist. He was paid 30s. a day by the government, who acquired the pictures. Nash's two most important paintings, Over the Top and The Cornfield. John Nash married Christine Kühlenthal on 30th May, 1918. The couple lived at Whiteleaf, Buckinghamshire. As well as painting in oils and watercolour, he also illustrated books. His drawings and woodcuts of this period reveal his knowledge of botany and this was notable in his book Poisonous Plants (1927). Nash also taught at the Ruskin School of Art (1924-29) and the Royal College of Art (1934-1957). According to his biographer, Ronald Blythe: "His method was to fill up sketchbooks with pen, pencil, and wash studies and then develop them in oil and watercolour in the studio. The sketches were covered with notes on the weather and information on natural history, and some even noted the mood of a particular day in Cornwall or Skye. 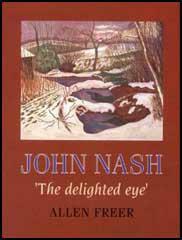 Nash liked the marks on the countryside made by farming and other rural industries, especially such features as ponds, cuttings, and quarries, and as the years passed his work became an unconscious, or unplanned, record of the agricultural depression, and its recovery." In 1940 Nash was commissioned in the Royal Marines as an official war artist to the Admiralty. Although he produced a considerable body of paintings during the Second World War, he confessed that his heart was not in this type of work. In 1944 he moved to Wormingford in Essex. He was appointed CBE in 1964. John Nash died at St Mary's Hospital in Colchester on 23rd September 1977. He was buried in the churchyard of St Andrew's Church.